Making your own healthy sausages at home sounds like a fantastic idea. 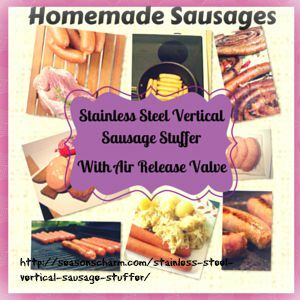 With the new VIVO 7 lb stainless steel vertical sausage stuffer for home use, it is very doable. 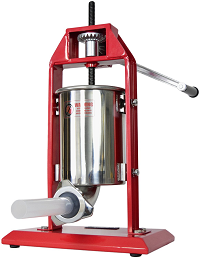 A stainless steel cylinder and a stable, all metal base as well as the all metal high torque gears make this home sausage stuffer durable and user-friendly. It is very easy to fill up the cylinder as it can be tilted back and locked back in place when filling is done. There is a total of 4 plastic nozzles with the tubes measuring 10 mm ( 0.4 inch), 20 mm (0.79 inch), 30 mm (1.18 inch) and 40 mm (1.57 inch). The crank handle has a wing-screw to lock it onto the shaft so it won’t slip off when you’re in the midst of stuffing your sausages. Another attractive feature is the metal piston with its air release valve. This enables the air to escape from the top instead of into the sausage casings. This saves you the trouble of having to prick the air bubbles in the casing. The VIVO 7 lb stainless steel vertical sausage stuffer for home use would make a great housewarming gift for home cooks.